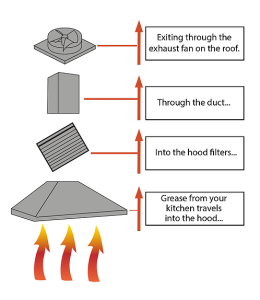 We now offer Hood Cleaning Service Throughout the Tampa Bay Area! Cooking produces a number of effluents including grease, moisture, and smoke. 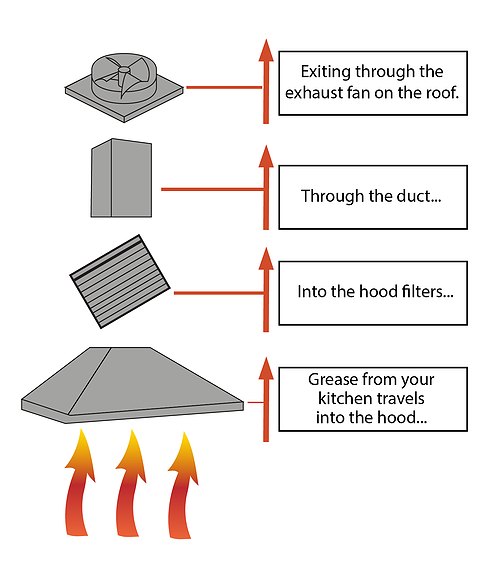 With the exhaust fan on, each of these components is drawn up through the kitchen hood, through the filters, and into the ductwork, where it builds up over time. Once the buildup is sufficient, it becomes a fire hazard—which can only be prevented through a regular cleaning schedule. It’s not hard to imagine how a fire can easily get started. A flame flares up on the stovetop and then gets into contact with the built up grease, which adds fuel. The fire is then drawn upwards by the exhaust fan into the ductwork and in a matter of moments you have a fire on your hand. The good news is that with a regular hood cleaning service from All Florida Fire Equipment you can reduce that hazard to almost zero. Our highly trained technicians work hand in hand with all our clients to keep a safe kitchen environment. We follow all state and local fire codes and are always in compliance with NFPA 96. We work with all our clients to choose a service schedule that best fits them and ensures that your kitchen’s fire hazard is kept to a minimum. Not only is All Florida Fire Equipment one of the bay area’s leaders in hood and exhaust cleaning. we also service and install automatic fire suppression systems and have the ability to service both at the same time for your convenience and operating efficiency. 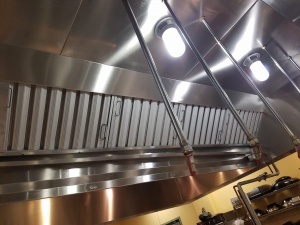 The complete kitchen exhaust systems (bottom to top) are first scraped clean and then washed clean with food safe caustic chemicals and hot water pressure-washed. We use caustic chemicals to break down the grease. After that, hot water is used to wash away the residue. Chemicals are generally applied with either a garden type sprayer, downstream injection through a pressure washer, or with a chemical foamer. Once the chemicals are applied, they are allowed to sit on the surface of the grease for a period of time before being washed off with hot water. In extreme situations, where grease buildup is too heavy for a chemical application and a rinse, scrapers may be used to remove excess buildup from the contaminated surfaces, before chemicals are applied. Machines can be used that both boil water and then apply this water under pressures up to 2000PSI. In a common method of preparation, heavy-duty tarps are first clipped to the hoods and then angled into plastic garbage cans to catch the run-off. As the cans are filled the contents are disposed of. The grease should be removed rather than just emptied into the local drains to avoid clogging issues. At your request, we will polish the hoods for easier cleaning and improved appearance. Our trained technicians apply a sticker to the hood of each cleaned exhaust system showing the date of the service. This is important so the local fire inspector and insurance adjusters can make sure you are in compliance with the local fire code. The NFPA 96 is the current code providing clarification on requirements for certifying technicians to ensure that equipment is maintained by qualified providers. Every day the technicians from All Florida Fire Equipment travel throughout the greater Tampa area providing our state of the art hood cleaning service to hundreds of customers. Give us a call at 727-525-5950, and we’ll be happy to visit your facility and give you a no-obligation quote for our hood cleaning service.